I've been sick for over 2 weeks. I thought I'd get better by taking some over the counter chemicals but I just kept feeling worse. It's such a hassle to drag myself to the doctor. Yesterday, I finally went in and 4 hours later I had a prescription for antibiotics to kick this nasty bug. The month of September flew by. 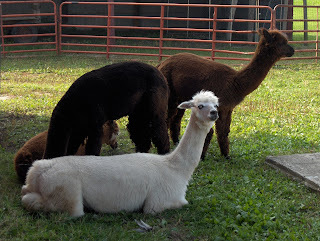 Over the weekend I took the family to meet a local alpaca farmer. 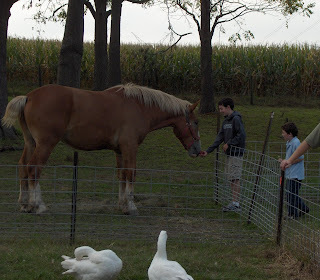 On the way home we stopped at an apple orchard to see more animals. We're headed into Chicago 3 out of the next 4 days. Both of my kids have birthdays over the next 2 weeks. I really hope these antibiotics kick in soon and I'm back to full speed. You're the pirate everyone else wants to throw in the ocean -- not to get rid of you, you understand; just to get rid of the smell. You can be a little bit unpredictable, but a pirate's life is far from full of certainties, so that fits in pretty well. Arr! Just a little bit of anxiety. I've been poisoning my family? This is just one of many statements I've pondered this week. Let's start with the plastic "bottle" issue first. In my quest to become less taxing on the environment I switched to using reusable plastic drinking containers this year. 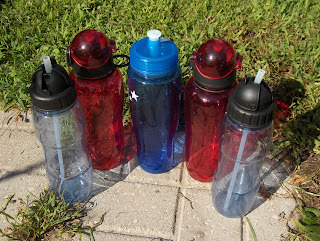 This week I read an article about how these reusable bottles were potentially leaching a harmful chemical,bisphenol A into the water we filled them with. That's fantastic! Here's our stack headed to the landfill today. So much for that plan. I'm not only poisoning my kids but I unknowingly contributed to my Basset's death? Let me explain how I arrived at this conclusion. A couple of weeks ago our pup started losing his fur and had some patches of bald spots. The vet checked for mites but found nothing so I did a bit of Google searching for pet food allergies. That's when I stumbled upon many articles of dogs poisoned by aflatoxin. "Aflatoxin is a naturally occurring toxic chemical that comes from a fungus found on corn and other grains that causes severe liver damage in animals." My poor Basset had exactly the symptoms listed for this poisoning and not once did the vet ask about his food. So our pup is now on a dog food that doesn't contain any corn. He seems to be feeling and looking better thank goodness. I didn't want to loose 2 dogs in a year due to toxic food. For you pet owners, there is currently a recall on several brands of pet food produced by Mars. Here is the website to check if the food you're feeding your pet is included in this current recall. Then there is the ECONOMY. 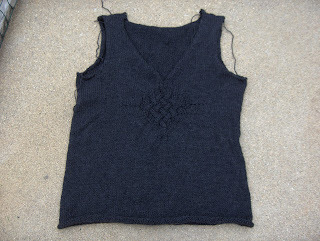 I've banned myself from my favorite NPR show Marketplace for the rest of this week. We are in one of the worst financial crises since the Great Depression and Bush is just now today stating "He's concerned about the economy." I need to unplug myself from Google news until November 5th. I fear my head will explode trying to remain calm while constantly checking the latest polls. 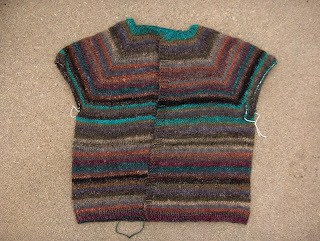 and my Noro top-down raglan cardigan(another Ravelry link). 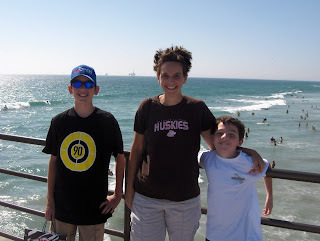 When we finally arrived in sunny Southern CA, life was good. 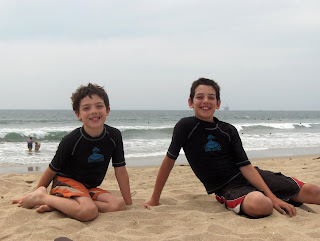 We went to the beach every day and my Illinois boys loved every minute of it. On one of our outings I came across a yarn shop,Alamitos Bay Yarn Company. This store has an annex where knitters can hang out on really comfy sofas and recliners, make a cup of tea and feel like they're at someone's house. Sweet! Our week went by way too fast as do most vacations. It really made us question why we were traveling back across the country to go home to a location where the weather makes us all grumpy. The cost of living is lower in Northern Illinois than in Southern CA but I think we may be ready to start planning our escape plan.